“These dishes are not getting clean!” Amanda yelled. I went to the kitchen to see what the problem was. “Look at these bowls!” Amanda said. I looked at the bowls that had just come out of the dishwasher and they still had soup residue around the rim. I then checked the dishwasher filter and I was shocked! The filter was completely clogged up with some sort of white residue! We have been using generic gel dishwashing detergent. We have not been using a dishwasher cleaner. This problem caught me off-guard because I have checked the filters several times before and they always looked clean. Since the filters never seemed to get dirty, I just forgot about checking them. This is how our upper dishwasher filter looked. It was completely clogged with detergent and limescale residue. I don’t know what changed that made the filter clog up like it did. I suspect that one of the brands of gel detergent we used is to blame. We have been using several brands and I don’t know which one is responsible. I don’t like gel dishwashing detergent, but we started using it as a convenience for Amanda. She has a TBI (traumatic brain injury) that affects her coordination. She was having trouble pouring the correct amount of powder detergent into the detergent dispenser receptacle on the dishwasher. She would overfill it and then the little lid on the receptacle would not close. We switched to the gel so if she did overfill the receptacle, she could still close the little lid. Why Was I Not Using A Dishwasher Cleaner? 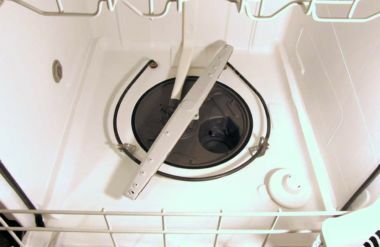 I have been using dishwashers for decades and have never had a problem with limescale buildup or detergent residue in a dishwasher. So I didn’t think I needed to use a dishwasher cleaning product. Now I am having a problem. I guess the dishwasher detergents are just not what they used to be. The detergent formulas have been changed due to environmental laws and regulations and that is something we will have to accept. I guess even old-timers like me will have to start using a dishwasher cleaning product. I am also going to switch back to a powder or tablet dishwasher detergent. I have looked at several dishwasher manuals from different manufacturers and they all recommend using powder, tablets, or the dishwasher packs. I have an idea that will help Amanda use the powder detergent. I hope to reveal that idea soon. You must clean the dishwasher and dishwasher filters on a regular basis to maintain optimum performance of the dishwasher. If the filters become clogged, then the water doesn’t circulate like it should. When the water doesn’t circulate like it should, your dishes don’t get clean. The upper filter assembly has a fine mesh filter that keeps small particles out of the pump. 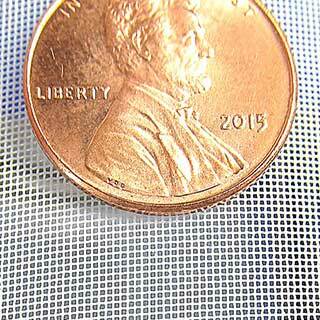 The material is so fine that at a distance it looks like sheer nylon fabric. This fabric can become clogged with gummy detergent residue. Once it becomes clogged, it can be difficult to clean the gummy residue out of the mesh. Another issue that a dirty dishwasher causes is film on the dishes. When the inside surfaces of the dishwasher are coated with detergent residue, some of that residue will mix in with the wash water and end up on your dishes. Residue buildup and rust stains in the dishwasher. The filter screen on the upper filter has tiny holes that easily become clogged. Use a once-a-month dishwasher cleaner to prevent limescale and detergent residue buildup. Wait until the dishwasher stops working properly and then do a dishwasher deep-cleaning. Obviously, the first option is the preferred method. Take out the filters and rinse them off in the sink. Reinstall the filters. 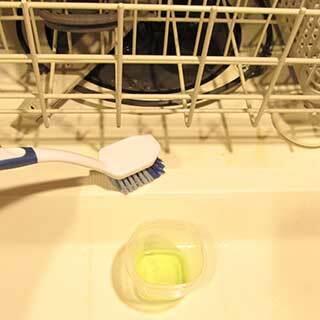 Run an empty dishwasher cycle with a citric-acid based dishwasher cleaner. Use per the package instructions. I recommend Finish Dual-Action Dishwasher Cleaner. This product contains a bis-phosphonic acid salt that works in conjunction with citric acid to remove scale and deposits. That is why it is called Dual-Action. Some people have success doing a maintenance cleaning with white vinegar. You could use Heinz Cleaning Vinegar if you need extra strength. What most dishwasher manufacturers recommend is putting 2 cups of vinegar in a measuring cup and placing it on the bottom rack. Then you run the empty dishwasher on a normal cycle. Do not pour your vinegar directly into the dishwasher tub. The dishwasher will extract at the beginning of the cycle and your vinegar will go down the drain. Instead, place the vinegar in a measuring cup on the bottom rack. Once the cycle starts, the cup will overflow and the vinegar will mix in with the wash water. 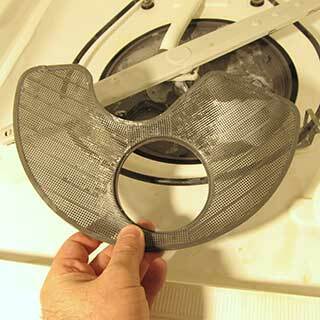 If the dishwasher is very dirty you may need to use this method. For dishwasher deep-cleaning we will be using CLR Calcium, Lime & Rust Remover. This product is many times more effective than vinegar for dissolving calcium and rust. Based on a pH comparison and the acid concentration of CLR vs vinegar, I estimate that pure CLR is about 15 times more effective at dissolving calcium than household vinegar. In other words, 1 cup of pure CLR is as effective as a whole gallon of vinegar. The label recommends that you wear gloves when using the product. If you get it on your skin it will cause irritation and you must rinse it off under running water per the label instructions. Please read the safety-precautions on the label before use. 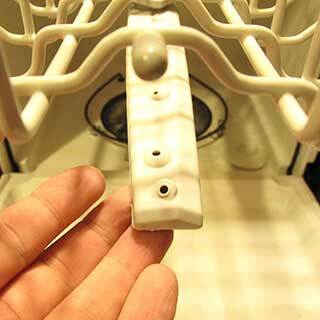 The first thing we want to do is to clean the dishwasher door-seal gasket. For this I mixed up 2 tablespoon of CLR with 2 tablespoon of water to make a 50/50 mix. Dip a toothbrush in this mix and scrub the buildup off the door gasket. Do not get it on your countertop or your tile floor. You may want to put down an old towel to catch any drips. Immediately after cleaning, wipe off the gasket with a damp sponge. 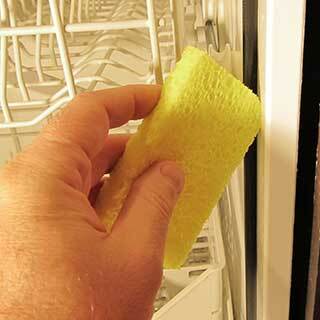 Go over it a few times, rinsing the sponge as you go, to make sure the acid is gone. 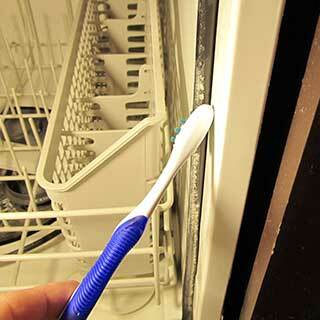 Brush the residue off the dishwasher seal with a toothbrush dipped in the 50/50 CLR solution. After brushing, wipe off the seal with a damp sponge. Go over it a few times to ensure the acid is gone. Now we will remove the upper filter assembly and the lower filter. You have to twist the upper filter to remove it. The flat lower filter should just pull out. To remove the upper filter you twist it and then lift it out. The lower filter just pulls out. My upper filter was in very bad shape, so I had to scrub it in the sink with a toothbrush and the 50/50 CLR mix. You can also clean off any heavy deposits from the lower filter at this time. Save your CLR mix. You’ll need it for a later step. 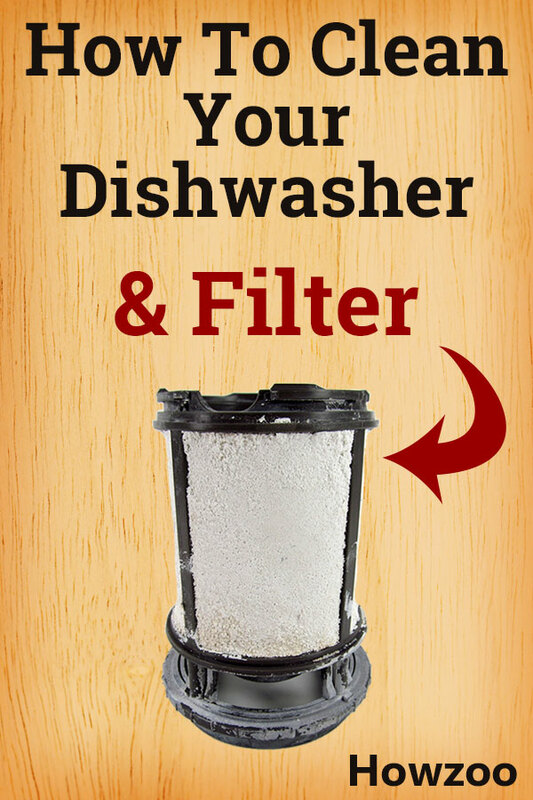 After cleaning the filters, go ahead and put them back in the dishwasher. 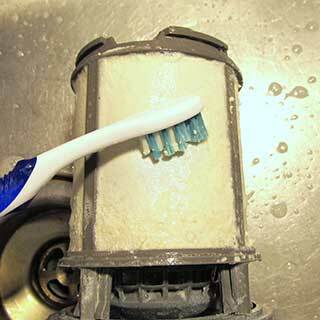 Clean the filters in the sink with a toothbrush and the 50/50 CLR mix. Now you need to check the holes in your spray arms to make sure they are not plugged. If they are plugged you will need to remove the spray arms and soak them in a CLR solution to dissolve the deposits. The arms are hollow on the inside. On my washer, there is a plastic nut under the center of the spray arm. You can twist that nut by hand and the arm comes right off. Check to make sure the holes in the spray arms are not plugged. 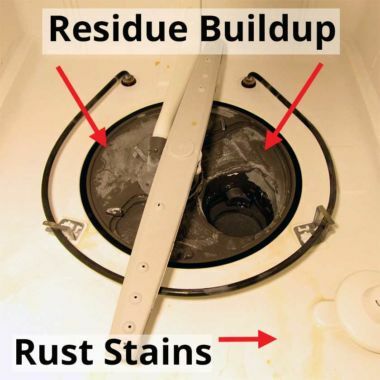 The next thing we will do is to clean any tough rust stains and also clean the detergent dispenser. I had some rust stains in my dishwasher from a rusty baking pan that dripped. The toothbrush was a little too small and soft, so I used a dish brush with the same 50/50 CLR mixture. The rust stains came right off. You can use the CLR full-strength if you have some stubborn rust stains. 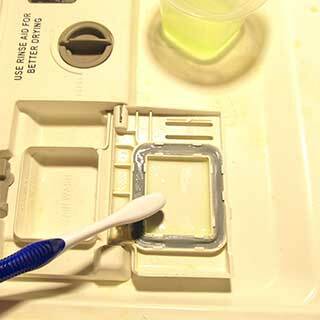 Next, clean the detergent dispenser gasket and tray with your toothbrush and the 50/50 CLR. The reason you want to save this step for last is so you don’t have to rinse the acid off the little dispenser gasket. 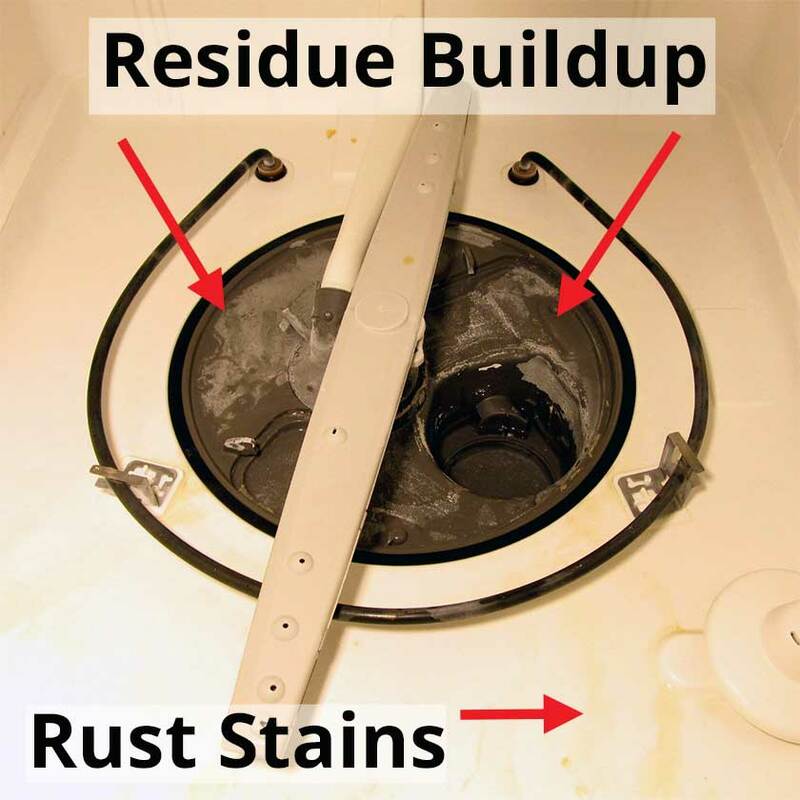 You are about to run a wash cycle and the gasket will get rinsed in the wash.
Brush rust stains with the CLR mix. You will need a larger, stiffer brush for this step. 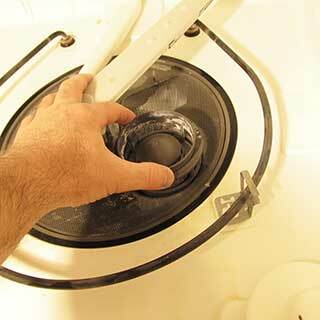 Clean the detergent dispenser and the gasket with a toothbrush and the CLR mix. 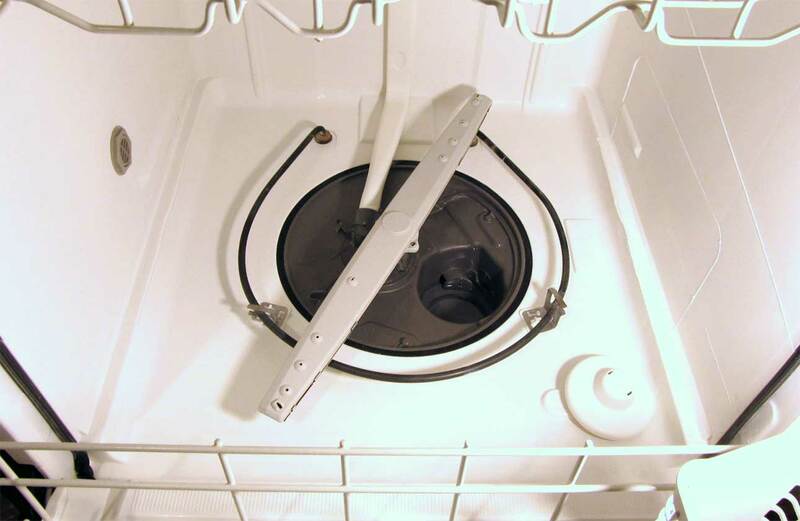 Now that the manual cleaning steps are done, you will run a dishwasher cycle to finish the cleaning process. This dishwasher cleaning video by the Cary Company states to pour 1/2 cup of CLR into the bottom of the dishwasher. This Jelmar FAQ also states to pour 1/2 cup into the bottom. Jelmar is the company that makes CLR. On the other hand, this Jelmar dishwasher article states to add ½ cup of CLR once the machine is at least halfway filled with water. We know that some dishwashers extract immediately after the cycle starts. I know that mine does because I can hear the water going down the sink drain right after the cycle starts. This means it may not be a good idea to pour the CLR straight in the bottom. I think the last example above is the correct way. This way your CLR doesn’t get flushed down the drain. What I chose to do is to use the old trick of putting a container in the bottom rack. I took a 1-cup measuring cup and filled it half full with pure CLR. I then placed this on the bottom rack as shown. The reason I chose the bottom rack is because my top spray arm is in the middle. I want the CLR to overflow and if I put it on the top rack, then there may not be enough spray to make it overflow quickly. Place the CLR on the bottom rack to ensure that the spray arm makes it overflow. Do not use any detergent during this step and make sure there are no dishes in the dishwasher. Run a normal cycle using hot water or the high-temperature setting if you have it. When that cycle finishes, remove the measuring cup and run another cycle to rinse out the CLR. The CLR did a pretty good job. It will not get out all traces of buildup but it gets a lot of it. The dishwasher interior looks a lot better than it did. The dishwasher looks pretty good after running the CLR. Now that we have have performed the deep-cleaning, we can maintain the dishwasher by doing the monthly maintenance cleanings. 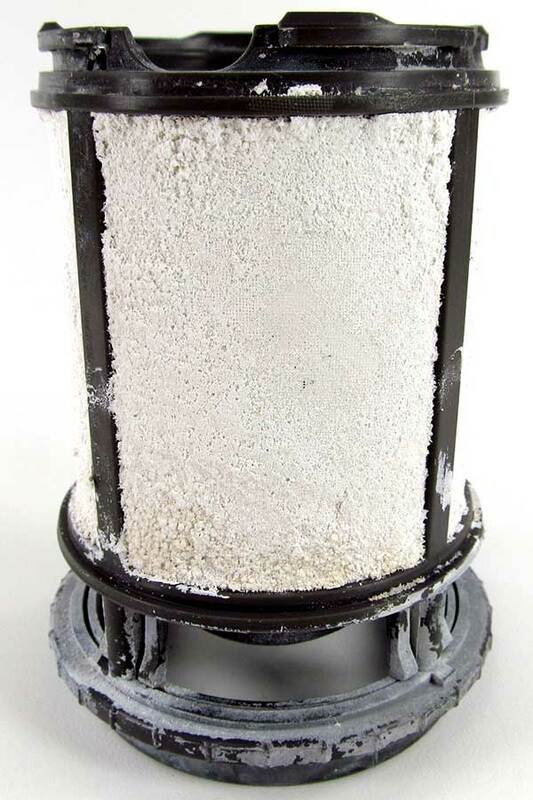 The monthly cleaning will remove any remaining residue and help keep the filter from becoming clogged with detergent residue. I use 1/4 cup with every dishwashing cycle. Is this harmful? I don’t think it is a good idea to add vinegar or other acids in your normal dish-washing cycle. Dish-washing detergent is designed to be very alkaline. This is how it cleans your dishes. If you add vinegar, you are actually neutralizing your detergent! If you are trying to get less film, try using less detergent instead of adding vinegar. Vinegar, CLR, and the various dishwasher cleaners are better used by themselves. They work better that way. I just used CLR and now the dishwasher is full of suds!!! I have now run about six cycyles with either plain water or with salt to get rid of the suds. Each cycle comes up with suds at the end. Help? There is nothing in CLR that makes suds. It sounds like somebody has been putting liquid dish soap in the dishwasher. Or maybe someone put dish soap in the CLR bottle. Try adding some olive oil to kill the suds. You mention that the CLR Made the interior look a lot better…but did it improve/restore the cleaning ability of the dishwasher? Yes in fact it did. Just getting that filter clean resulted in better water flow inside the washer.